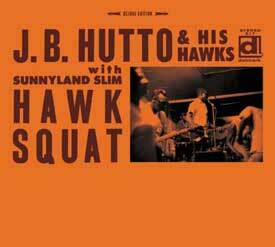 “The raw-as-an-open-wound Chicago slide guitarist J.B. Hutto outdid himself throughout an outrageously raucous album anchored by an impossible-to-ignore ‘Hip Shakin,’ the blaring title cut, and savage renditions of ‘20% Alcohol’ and ‘Notoriety Woman’.” – Bill Dahl, allmusic.com. The rough and rowdy blues heard at Turner’s Lounge was the inspiration for this explosive 1968 recording. Blues legend Sunnyland Slim guests with The Hawks on piano and organ. This Digipak Deluxe Edition contains the previously unissued song “I’ll Cry Tomorrow,” alternate takes of “Hawk Squat,” “Too Much Pride,” “Same Mistake Twice,” two alternates of “Speak My Mind” and a 20-page booklet with many never-before-seen photos from the recording sessions and Turner’s.